I think baking homemade bread is one of those things that just about every Mom and friend I know would love to do. All while raising littles and keeping them clothed and fed and educated and entertained. And, in a house that looks like something other than a pig sty. And, all while hoping and praying that this dough that's been so cared for and loved turns into bread - and not a cement block. Because who wants to rise, punch, rise, bake - only to be terribly disappointed with what comes out of the oven? Bread baking - yeast bread baking - though rewarding and wonderful is just not one of those things that most Moms (and busy friends) I know are able to do on a regular basis. Yes, I have friends who do it. Every week. On baking day. I have never been able to do that. Baking day in my house would be the day that my children would tear every single article of clothing out of their drawers and closets, and every tissue out of every tissue box in the house. And, then attempt to burn it all in a yeast-dissolving, dough-rising, punching-down, rising-again protest ritual. So, what's a bread-loving Momma to do? There is this company - that starts with Tastefully and ends in Simple - that sells the most wonderful beer bread mix. And, all you have to do is add a bottle of beer (or soda) to the mix, bake it, and out comes a killer loaf of bread. I love it, and buy it from time to time. But, it's expensive at over $5.00 per pack of mix that makes one loaf. And, because it's sold at a home party, it's not readily available to most of us all of the time. So, I set out on a quest to create a recipe for beer bread that tastes the same, if not better, than Tastefully Simple's Beer Bread. After several attempts over the last year or so, this combination of 6 simple ingredients will yield the most delicious loaf of beer bread - and if baked next to a loaf of Tastefully Simple's Beer Bread, I don't think you'd be able to tell the difference. So, why is this bread so easy and most other breads so laborious? The beer in this recipe does all the work for you. Just mix all of the ingredients together in a bowl, and bake. And, it comes out perfectly. Every. Single. Time. Oh, how I love this bread. The crispy, crunchy, buttery top. The soft, warm middle. 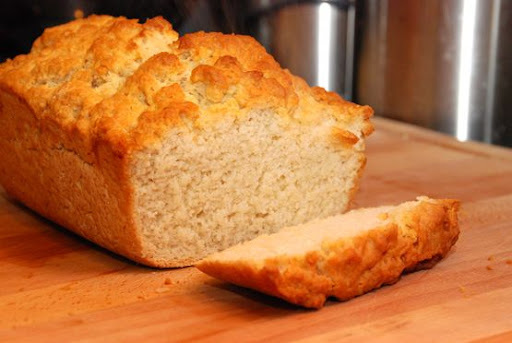 So, if you love beer bread, or if you just want to have a delicious loaf of easy-to-bake bread any night of the week, try this recipe. Just don't try making a grilled cheese with it - unless you want to gain 10 pounds. Because this bread makes the most insanely good grilled cheese sandwiches you've ever had - and you'll crave them noon and night. Here's to beer bread. And, the littles who will have to burn in protest another day. Preheat oven to 350 degrees. Spray a 5" x 9" loaf pan with cooking spray. Set aside. Sift flour, sugar, baking powder and salt together in a large bowl. Add beer and mix until combined (Dough will be sticky). Place dough into loaf pan. 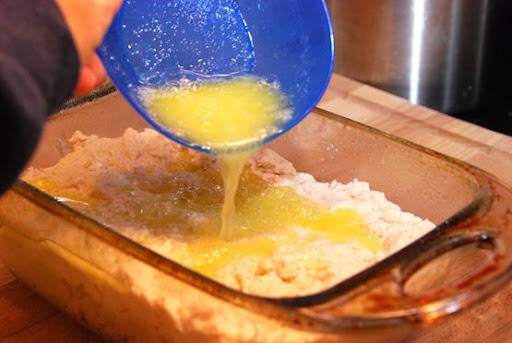 Pour melted butter over top of loaf. Bake at 350 degrees, uncovered, for 50-60 minutes, or until top is golden brown and toothpick comes out clean from center. *If desired, you can substitute a 12-ounce can of soda for the beer in this recipe. 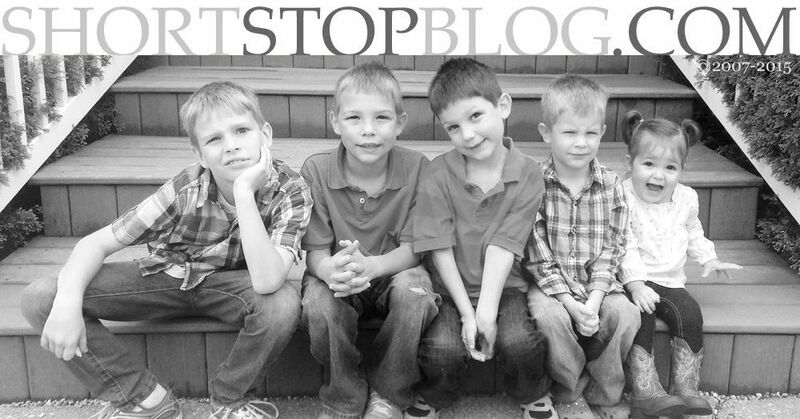 For more tips on Wednesdays, visit We Are That Family each week. "If desired, you can substitute a 12-ounce can of soda for the beer in this recipe." Now why would I want to do that. Hey Sarah- If you want to make it into a dessert bread- add a can of mountain dew instead of the beer and cinnamon chips- meijers carries them. It's the most delicious thing ever!! I know and love those cinnamon chips. I'll have to try that! Sounds delicious! I love making beer bread . . . never tried the melted butter on top, but that sounds delicious! i'm gonna have to try that. i'm always experimenting w/ breads. and, yes, i love the whole bread making process but found that the time necessary just wasn't happening. so... i got a bread maker. some would say it's cheating... but it comes out the same. you can adapt your own recipes... and i take the dough out and shape it and bake it myself so it doesn't come out the shape of the bread machine tray. you may want to try it - lots of endless possibilities :) i make all my own pizza dough w/ it now, too! I actually do have a bread machine - and I love it for making pizza dough. Totally with you on that one. But, it's one of those appliances that I never feel like dragging out. Heavy, big, one-purpose. I should get it out more, though! 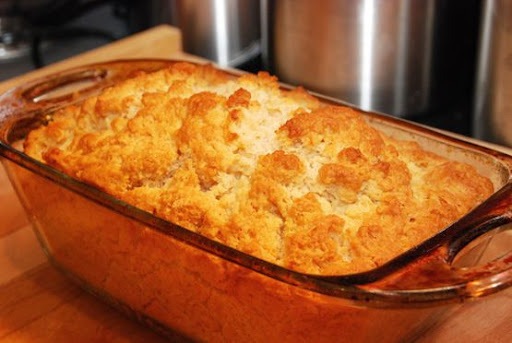 My husband loves beer bread, but I've never made it... looks like a project for this weekend! Do you think I could add a bit of cheese to the recipe? You could definitely add cheese to this. It's a very flexible, forgiving recipe. I've added herbs to it as well. I saw the title and thought "eh, I'm not even going to read this one because I'm not going to bake bread." Then I read it and I'm convinced!!! Beer bread it is! I"m trying it! Oooh I'm definitely making this one! I've always been intimidated by bread so I've never made it! I can't wait! Thanks for the recipe-it looks delicious! I have just started getting interested in baking my own bread, so this will be great. After reading Katie's comment and all the cool stuff she does with her bread machine, I'll have to look into all those options. But oh, how I hate to read instructions for small appliances-I'm a much more hands-on learner! true... but try using it for dinner rolls - those sweet, yeasty ones that no one makes any more. soooo good. takes dinner to a whole new level. Except mine has WAYYYYYY more butter. Must be why I'm fatter than you! Ok, you've convinced me. I'm gonna make rolls this weekend. I actually have a good family recipe that I've never posted, so I'm gonna make the dough in my bread machine! Thank you for encouraging me to do it! Momma Roar, how scandalous!! LOL! Oooh, I bet all that butter on top is *really* good! I love butter with a deep, deep passion! Blessings on you my child! We love the TS type; I actually made a loaf last night. If I can make it this way I'll be thrilled! I love you! If I could jump through the screen I would hug you. My daughter just said this past Saturday that she really wishes we would have Beer Bread because she loves it. I don't buy it often because of the cost. This is just the best news evah today! Making this right now just put two loaves in the oven. These will be great for the lunch post The Boys Baptism. I just made beer bread for a potluck at work today. I can't wait to try your recipe - it'll be a ton cheaper!! Thanks! This looks SO good and I HAVE to try it! Our neighbors recently gave us a six-pack of beer and while we like beer, it's not our beverage of choice. I much prefer the taste in breads. Does it matter whether you use light or dark beer? I have used many different varieties of beer - and all of them have been good. I prefer a darker beer - I like the depth of flavor it adds. But, really - you can use any kind! Sarah, I just made the beer bread... with roasted garlic cheddar cheese! I added garlic powder to the butter before pouring it over the top. It was wonderful and super easy to make after a long commute. I love that the texture is similar to a yeast bread. Thanks! I have got to try this! Though I have a very good friend who is a TS rep who might not like that very much! He he he. Oh well, she can still keep me stocked on Fiesta Dip, Spinach Dip, and Onion, Onion. I made this last night (with dark beer) and it was DELICIOUS! Five of us polished off a loaf in no time. I made another one tonight to eat with your cheese fondue and all I can say is YUM! It's definitely become a favorite around here. I want the Cheese fondue recipe!!!! I know it's ridiculously old as a post, but I JUST NOW made the bread. Last night. With spinach-filled chicken roll-ups. Mercy! DH and I LOVED it (we used a dark ale). One bite and he moaned. I said, "This is from the woman who brought us the gigantic blueberry muffins. We love her." He nodded because his mouth was too full to say anything. Keep the great recipes coming! We are SO making this, thanks so much for sharing the recipe! Sweet Sarah, I just shared this recipe AGAIN. It's an all time favorite of mine and it makes me think of you. I went to a TS party last night and cringed a the price of their bread. So thankful you love to experiment and make my life easier with all your great recipes. I'm getting a craving for your pretzel ice cream dessert...YUMMO! I must have done something wrong... because this is the worst beer bread I have ever had =p... I think I may have added too much flour =/ I'm not sure.. but it is SUPER thick and kind of rubbery when I bite into it. 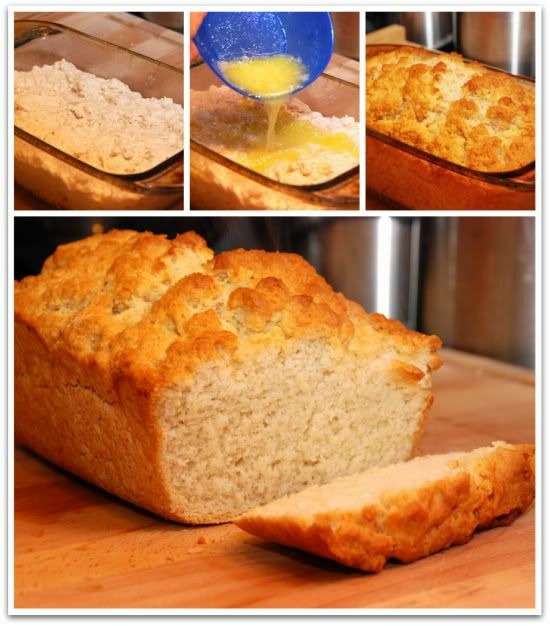 Making homemade beer bread is OH SO MUCH CHEAPER than Tastefully Simple! Once I found a recipe I saved alot of $$ and it's wonderful! Try using Sam Adams Cherry Wheat beer. You get a nice hint of cherry flavor that's to die for! Did you use all-purpose flour or self-rising? Just found your recipe. Used a dark amber beer. Wow it is fantastic. Thanks. I don't drink beer (or anything else for that matter lol), so my question is what kind of soda? Hope that is not a stupid question... New to baking but so want to be good at it! Ok what kind of beer? All we have is bud light in this house....guess ill give it a try thinking of putting it in cupcake pan instead of a loaf pan. You can use any kind of beer. Dark or light. Self rising or all purpose flour ? My family LOVED this bread!!! It was so easy, thank you for the recipie!! I used Yuengling and it turned out amazing! I'm never making bread with dry yeast again. It tasted sweet which my family loved, but I was curious if I wanted to add ingredients like garlic and cheese, or jalapenos and cheese should I reduce the sugar? I'm sure I will be making this recipie AS IS weekly since my family loved it so much, but I want to play with it too. You should leave the sugar just the same! The bread will taste savory with those ingredients added. Sounds delicious! just made it with the Blue Moon fall beers (the spiced apple one and a second loaf with the pumpkin). They turned out awesome! Thanks!!! Just made this and it is delicious. The only thing I suggest is that if you are using a glass loaf pan adjust the oven settings. Mine came out pretty crispy. I just made this with all-purpose gluten free flour and it was great. I used sprite since I didn't have any g-free beer. What about making mini loaves ? Would this recipe work ? Mine is in the oven right now but one small change... I ran out of regular beer so I am using lime-a-Rita!! I'll let y'all know how it tastes. I keep TS in business by buying their beer bread mix, but no more thanks to you!!! You deserve props for life! Thank you!! i've already made three loaves today.. fantastic recipe! thank you so much! Thank you very much, going to try this today! I started making garlic bread sticks using the TS beer bread, can't wait to try it with this recipe! Then I read about beer bread making insanely good grilled cheese, so what if I made a loaf of garlic beer bread and then made grilled cheese with Mozzarella cheese and some marinara sauce for dipping.. If you were going to add herbs or spices to this.. would you add it before or after baking? Say I wanted to make Rosemary and rock salt bread.. would I add that once the bread is cooked? Or sprinkle it on top of the butter and then bake it? And for the price of that Tasteful stuff, you can make about 8 - 10 loaves of this. Love it. We like our's with dill. Guess I'm late to the party - just tried this recipe last night. It turned out great! I have been a fan of TS bread (except the cost) and found a mix that was less expensive, but now that I have this recipe, I'll never buy them again! I used Yuengling beer, which is a favorite of hubby's, so it was convenient. I don't think the beer taste is really noticeable, but it does give the bread that touch of yeast flavor like traditional yeast breads. This may be a stupid question! Can you make this without using a sifter? In my opinion sifters are a waste of time, energy, and valuable cupboard space! Just dump all of the dry ingredients into a bowl and stir together with a whisk! If you don't have a whisk you could use a fork. I just made a loaf this morning. I like it except for tasting the baking powder. Other than that it is very good. Is it possible to use less so I can't taste it in there? Does the beer need to be cold or warm? Thank you, Thank you, Thank you!! In the past, I have hought ky beer bread mix from a place in WI Dells, but the cost was killing me ($7 a bag!) You just made my week!! My friends will also be excited to see this!!! I have the same question as one of the Anonymous posters above. I remember playing with grandma's sifter when I was a kid, but I don't own one myself. Can this be made without? I just made what I hope is my last loaf of TS beer bread and am anxious to try your recipe soon to compare the two! Um I think I love you. Let's be best friends and get fat off beer-bread grilled cheese sandwiches for breakfast, lunch, and dinner. Our husbands won't mind a smidge, I'm sure. Thank you x 1,000,000! This turned out delicious, will make this again! My mom's recipe is this: 3 c. self-rising flour, 3 Tbsp. sugar, 1 12-oz can beer (room temp). We always put the melted butter on top, afterward. Haven't tried putting it on before. Super simple. We've made this for 30 years or more. This recipe rocks! Have made it several times. I do not use a sifter. So simple. Thank you! Is this a recipe I can pass along to others? And if so, how do you want me to give reference to you? I made this today and it turned out great. It's good with homemade dill dip! Want to make it even easier, use Bisquick instead of the flour and baking powder. I have added so many things. I've drizzled garlic butter on top, with italian herbs sprinkled inside the recipe. I've used Dr. Pepper, and seven up. You can spread preserves inside the batter too. Play with it, you can't mess it up. Does anyone know how it would be with Spelt flour? I will be trying this soon! Yum! Just made it with Sprite rather than beer. I added 1/2 cup raisins. Next time I make it, and I will make it again, I will try using 2 tablespoons of butter rather than 3. It was a bit too oily. Other than that, it was delicious! Made it a second time with Sprite. I added 1/2 cup raisins and 1/2 cup sugar rather than 1/3. We like sweet. Reduced butter to 1.5 tablespoons. It was delicious! A new favorite in my house. When done this way it is reminiscent of Irish Soda Bread with raisins added. Just wondering if anyone has used Seagrams instead of beer or pop?? Crossing my fingers, I just took the loaf out of the oven.... Because I made a mistake!! You know one of those mistakes you make when you don't read the whole recipe and you think you know what your doing.... Oh well, my mistake happened when I mixed the melted butter in with the batter! I tried to correct my mistake by adding 1/3 cup of flour, to make it less runny (did not add more butter on top) and left it to bake the whole 60 minutes..... And guess what, it came out fabulous, my 4 boys loved it! Thank you for sharing a delicious forgiving recipe! This went straight into the Favorites file. I've been craving this for a few weeks and finally made it today - when you're 34 weeks pregnant, you don't deny cravings. :-) I might have to hide it from my family. I used spelt flour and it turned out GREAT! This is a scrumptious recipe! 4 1/2 years later and I am still making this bread. 3 cups self rising flour, 1/3 cup sugar, 1-12oz can beer, mix all together, put in greased bread pan, & bake @ 350* for 50 minutes. I just made this for the first time for the PTO bake sale tonight. Is it wrong that I want to keep it and eat it all? YUMMY!!!!! You can quite often judge the nature of an eatery by the nature of their bread. Eateries that "get it" in the brilliant bread division, "get it" in the superb fixings one.